The Nikon Bolt XR Crossbow Scope is a non-illuminated crossbow scope with a shock proof, waterproof, fog proof body. Designed for archers, this black matte crossbow scope measures 8.1 inches in length and at its widest point has a diameter of 2 inches. Thus, it is of the same size as most of its competitors. Furthermore, the Bolt XR Crossbow scope weighs 11.2 ounces and thus does not add much to a crossbow’s overall weight. With a 3X magnification, the Nikon Bolt XR crossbow scope is capable of spotting targets for 60 yards. The magnification is paired with a BDC 60 reticle that offers precision and accurate aiming points from 60 yards. 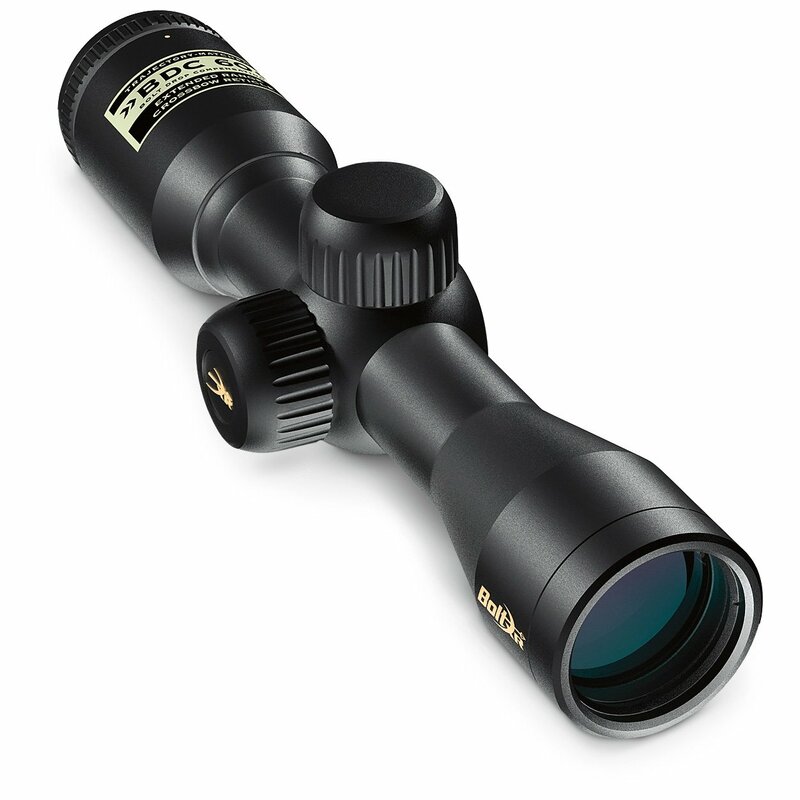 To enhance its performance, this scope features a parallax setting of 20 yards. The optical performance of the Nikon Bolt XR Crossbow is exceptionally brilliant. Thanks to the scope being fog proof and waterproof the optics on this ﻿﻿crossbow are crisp and clear. Also, the scope performs exceptionally well in low visibility and poor weather conditions. The scope’s optics do not fog up during cold seasons. The scope has an impressive eye relief of 3.4 inches, and the fast focus eye piece has a quick focusing +/-4 diopter adjustment. While this Nikon optic provides clear and crisp target images, it lacks an illuminated reticle. Nevertheless, the scope is able to transmit an estimated 92% of available light. Thus, despite it lacking an illuminated reticle, this crossbow scope offers excellent brightness and contrast. 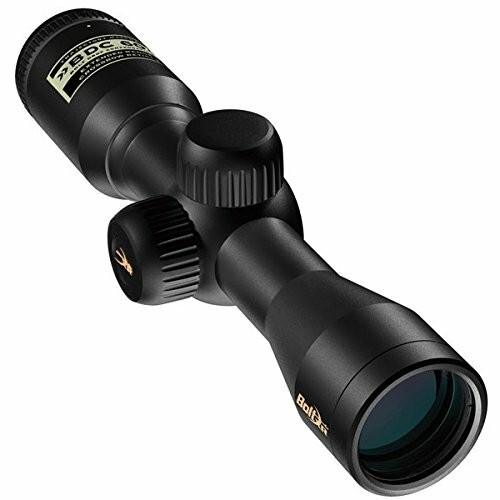 The scope is an ideal scope for hunting in low visibility. However, its performance is restricted to pre-dusk hours. During normal hunting hours like after dusk, the scope struggles to transmit sufficient light. Although the XR Bolt crossbow scope from Nikon performs exceptionally well, it is not without faults. For starters, its non-illuminated reticle features reticle dots instead of reticle lines. In the absence of illumination, these reticle dots are difficult to see especially in low lighting. However, it is possible to get used to the reticle dots. ​According to the manufacturer, this crossbow scope has a field of view of 35.6 at 100 yards. This estimation is pretty accurate, and the scope offers a large viewing area from 60 yards, making this scope perfect for hunting big game. ​In regards to ease of mounting the scope, this Nikon scope is not offered with mounting rings. Thus, the rings have to be purchased separately. While this can disappoint some buyers, the scope makes up for its lack of mounting rings by its ease of mounting. With the scope’s in place, mounting the scope takes seconds. ​The XR Crossbow is compatible with crossbows with a shooting speed of less than 350 FPS. The scope is fitted with a zero-reset turret that makes it easy to remember the sight in position. The spring-loaded adjustment knob can easily be rotated to a shooter’s zero. Furthermore, given that the scope is shockproof, it is capable of holding zero for months on end. The only problem with the scope is that it is only compatible with bows with speeds of less than 350FPS. Any crossbow with a shooting speed beyond the 350 FPS will not be ideal for this scope. ​The XR Bolt’s construction is impressive, and it is able to survive regular use and abuse. The scope’s weather resistant and shockproof body hold up to the rigors of outdoor activities very well. The scope is able to survive normal bumps, knocks and jostles without any problems. Easy to use zero reset turrets. Uses reticle dots instead of reticle lines.